Although we're still in the midst of summer, the beauty world has begun churning out its Fall collections and OPI Fall/Winter 2016 is no exception. Created with the help of OPI's celebrity creative ambassador, Kerry Washington, the Washington DC Collection is an interesting mix of mostly cream shades. I was so excited for this release and unboxed it the second it arrived in the mail but as you'll see from the swatches below, some are downright gorgeous while others are straight up ugly. It is, however, a big collection so there probably is something for everyone in here... unless you like glitters because there are none. I was also a little disappointed with some of the polish names. 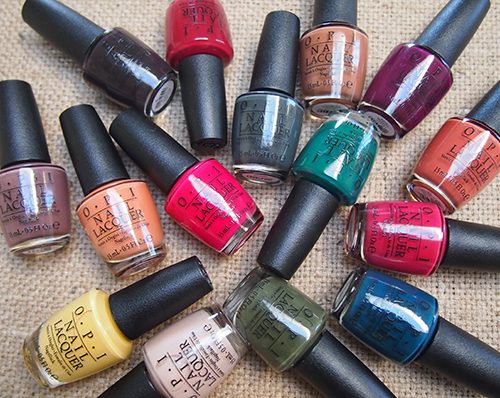 OPI is known for its super creative names (remember OPI x Hello Kitty?) and I thought they could have done a better job with the names in this collection. Maybe it's because I've never watched Kerry Washington's show "Scandal" to get the references or maybe it's just the nature of this collection's theme. Never a Dulles Moment is a bright taxi yellow. It was not easy to work with (I have yet to encounter a yellow that is) but the final result is worth it. Freedom of Peach is a creamy orange. It applied well but as you can see it looks terrible on me. Yuck. Yank My Doodle is a tawny coral/orange shade. Not my favourite but the "crelly" formula makes it a bit different from the other polishes in this collection. Pale to the Chief is a neutral light beige. I found it a bit streaky but it otherwise settled okay as it dried down. Squeaker of the House is a milky chocolate brown, slightly reminiscent of my old standby Sally Hansen Commander in Chic and is a clear staple shade for Fall. Madam President is described by OPI as a "commanding red" but I have no idea why since it's clearly not red. In the bottle and on the nails it's a cool-toned dark fuchsia. OPI by Popular Vote is described by OPI as a "cool apple red" but again I have no idea why. I think it's more of a berry cream. We the Female is a garnet cream. I'm not sure if I like this or think it's ugly... it definitely toes the line. Suzi - The First Lady of Nails is an olive green. I think this will be hit or miss for some. I personally like it but it's probably not for everyone. Stay off the Lawn!! is a deep jewel green, reminiscent of lush grass per its namesake. CIA = Color is Awesome is a dusky teal blue. I like how inky it looks and can't wait to wear this in the Winter months. Shh... It's Top Secret! reminds me a bit of an old favourite Essie Little Brown Dress since it's got some brown in it but it does lean more black. In addition to the above shades which are being added to OPI's permanent collection, they've also released three limited edition "bonus" shades which you can get in full-size or mini versions. Kerry Blossom is a plummy purple. There isn't anything particularly special about this (I swear I have at least 3 other OPI polishes that look almost identical) but if you don't have something similar, this is a good one to add to your collection. "Liv" in the Gray is my favourite polish out of this entire release... too bad it's limited edition! It's described as a "dark grey" but on the nails appears more as a beautiful greenish grey. On the other hand, you've got Inside the Isabelletway, which is a tan caramel. I personally think it's hideous. Not only does it clash with my skin tone, it just looks bad. Maybe this would work for others but it's definitely not for me. Squeaker of the House is my favorite of these!! squeaker of the house is gorgeous! very pretty shade! I'm so jealous of your collection! The only collection I've ever got from OPI was Nordics but even then I don't have all of them. These look lovely I love the bold colours. Haha! This is one of my favourite reviews ever. I enjoy your use of ugly/hideous throughout! LOL, I have some strong feelings!